"K-Stereo is a process that literally extracts the inherent ambience, space and depth in a recording and allows you to manipulate it... I know this sounds implausible, but it can be done and there is a solid psychoacoustic (patent pending) basis for the principle. In mastering we often get recordings that are too small, and K-Stereo is one of the best cures for that disease because it does not affect the inherent mix, unlike typical M/S and other such 'widening' techniques. K-Stereo is totally natural and in addition, it improves the clarity and definition of the instruments and vocals as part of the psychoacoustics of the algorithm." "Widening of the stereo base is an attractive feature for stereo sets with closely spaced loudspeakers... From this investigation it follows that the introduction of a small time delay in the crosstalk circuit shifts the regions with reinforcing localization cues in the direction of the listener, thus improving the localization of virtual sources in the widened stereo image." ...I discovered about 10 years ago that a short delay (Haas) between 15-30ms, 1 channel inverted and perhaps a low pass filter can really widen things without destroying the mono compatibility or changing the mix. It just takes a TINY bit of the delay to really liven up things. 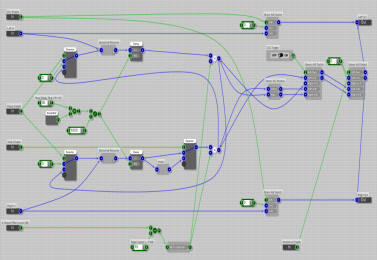 Aside from that, a simple M-S matrix followed by some envelope manipulation and finally, an L-R matrix is all I use." Let's be clear on something - I love Bob Katz. For those not familiar with his work as a mixer and mastering engineer of legend, Bob is one of a handful of guys (some others being Roger Nichols, The Lord-Alge brothers, George Massenburg, Rupert Neve, Alan Blumlein and Charles Dye) who have innovated, invented, educated and just plain helped set the standard for how modern recordings are made. It's just that I was re-reading Bob's book ("Mastering Audio: The Art and the Science, 2nd ed.") wondering about whether Bob's "K" mixing system is all it's cracked up to be, when I stumbled across another term of his: "K-Stereo". 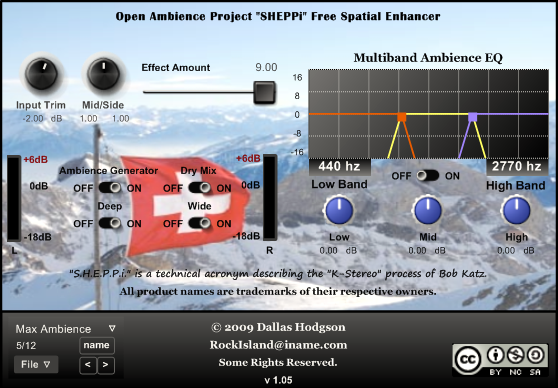 In the audio world, we work from a fixed menu of ingredients beginning with Volume, Frequency and Time, working its way down into such specifics as delay, reverb, phase, modulation and distortion before hitting the general weirdness of psychoacoustic principles like masking, combination tones, Fletcher-Munson curves, HRTF plots and precedence effects. Many wonderful techniques considered "trade secret" in their day (Flanging, anyone? ADT? Dither?) have since become standard practice and the guys who invented them (like Beatles' producer George Martin) have become legend. K-Stereo was something different, though. Bob basically took a few mixing concepts already in use (these would include early reflections, ping pong delay, M/S processing and the precedence, or Haas effect), applied them all at once and took out a patent on it - while conveniently sidestepping everything that looked like prior art. 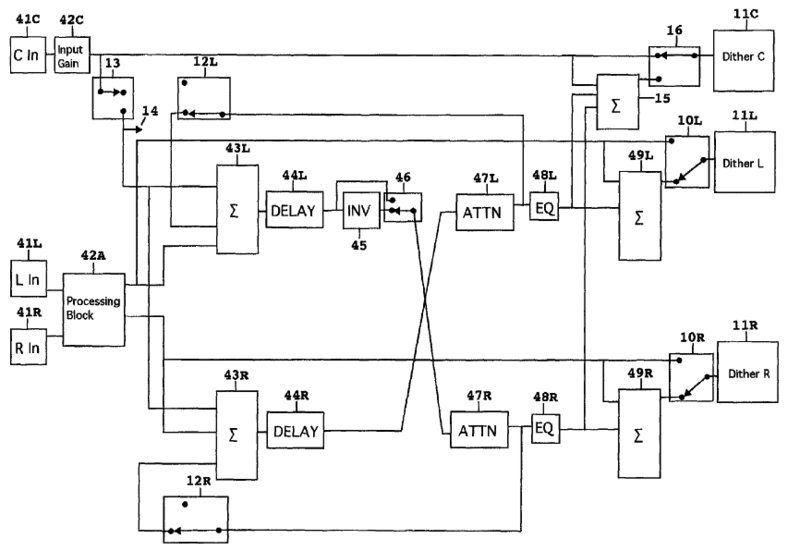 The algorithm, which is a clever but fairly simple and straightforward psychoacoustic spatialization effect, has roots in at least one 1983 AES white paper besides the Spatializer patent (whose roots go back to 1982.) A more descriptive term for what Bob's doing might be the acronym "SHEPPi", which stands for "Stereo Haas Effect Ping Pong Inverter". Yep, that's what it is. And it didn't take a patent to figure out - all it took were some basic signal processing techniques known (in patent legalese) "to those skilled in the art." What SHEPPi describes is this. You set up a ping-pong delay with feedback of around 30mS, which is the sweet spot for the well-known Haas stereo widening effect. Then, in one of the crossfeed delay lines you put an inverter such that the artificial early reflections are bouncing around out of phase (exaggerating the wideness) and out of time with each other. Bob adds some extra control over this effect by determining whether the delay feedback ("Deep" switch) or single-channel crossfeed inverter ("Wide" switch) should be on or off. 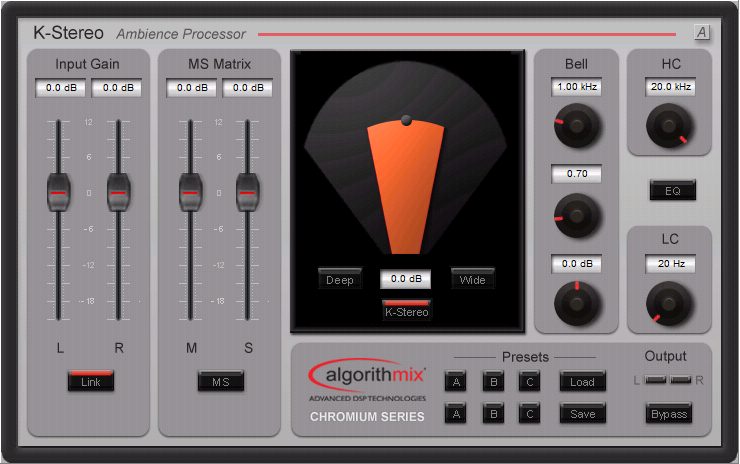 In addition, the K-Stereo process adds a couple of convenience touches easily simulated with other tools: an M/S matrix processor (also known as a "shuffler") preceding the effect, and a post-effect EQ module for tailoring the synthetic reflections. How close is this implementation to the real thing? Extremely close. Listen and compare! Prior to now, I was reluctant about making the plugin public - but having since talked this over with a patent attorney (thanks, TS!) I've decided to go ahead with it. At some point I may end up making the source code available so that anyone can compile their own plugin without any IP concerns (source code is protected under the First Amendment, you see) but until then the most important part of the code, the core process, is outlined below. Click on Fig. 1 to read the original, or Fig. 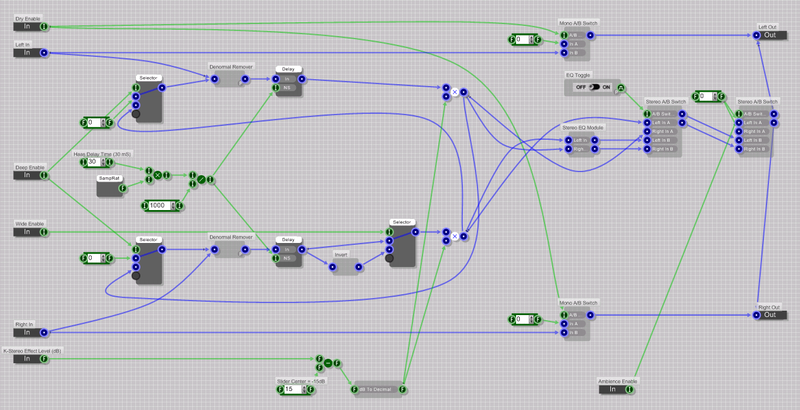 2 to see this effect maker's implementation. Meanwhile, let it be said that I'm making no money off this - writing this plugin was merely a fun project to get a few licks in programming for the SynthMaker development environment, and I'm a curious guy. "What a wonderful plugin you've made..... I'd been figuring out the patent trying to do the same but it didn't work like the real k-stereo thing. I thank you very much for making it work well with very best regards"
" It's amazing how tweaking it just a little, the sound becomes fuller, cleaner, and more pleasing to listen to. I've tried it on my own recordings and commercial ones, everything sounds better." Now the double-blind testing starts. When I was working on an early version of this plugin (no EQ yet) you could flip the phase of its output and it would actually sum to null against the original, which is as good as it gets. That said, working around the bugs in pre-v1.1.7 versions of SynthMaker was an adventure in itself - but since everything seems good and stable, just trust your ears and enjoy. Users running Windows 2000 and earlier may need to install Microsoft's GDIPlus DLL, available here. 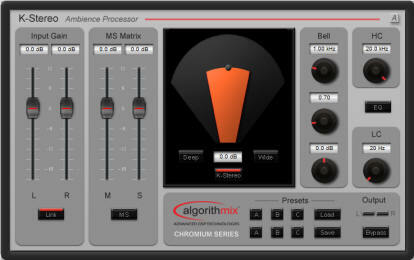 Apologies for the lack of a user manual, but if you've already read the guide to Algorithmix's demo plugin (hint hint) you're pretty much on top of things. SHEPPi is free to all, but accused WikiLeaks whistle-blower Pfc. Bradley Manning is not. If you found this plugin to be useful, won't you consider sending a little something his way? That's supporting REAL openness. Yes, I'm a friend of SHEPPi. Donate! <- Your best source for project updates. Follow SHEPPi for news!